UTV Side by Side Speakers. 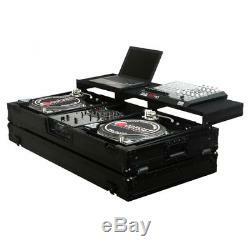 Odyssey FZGSPBM10WBL New Battle Mode Coffin Case For 2 Turntables & 1 10 Mixer. All Black Anodized and Powder Coated Hardware. Patented Full Width Glide Platform. Built-in Corner Roller Wheels For Easy Transport. Removable Front Mixer V-Cut Panel. Rear and Bottom Cable Ports. Mixer and Turntable Ventilation Pits. Turntable wells hold turntables with width of 15", depth up to 18". Mixer well holds mixers with a width from 8.75" to 10.25", depth up to 14" and 3.25" tall. Mixer Width Adjustment Foam Strips Included. As the evolution of the DJ continues, so does the designs of Odyssey DJ coffins. Introducing the new REMIXER GLIDE STYLE SERIES DJ coffins featuring a full width glide platform to place all your DJ remix gear. With digital vinyl software such as Serato, Traktor Scratch, and Ableton, more DJs have gone through the transition from beat mixer turntablist to full on remixer producer. Availability of so many affordable remixing tools to the DJ, such as midi keyboards and controllers to laptops and iPADs, have grown to an ultimate high and Odyssey is there in the middle of it all providing these DJs the most functional DJ coffins yet with the REMIXER GLIDE STYLE SERIES. Weekend and holidays are not counted as transit days. Each carrier has it's areas where service is better than another and we try to select the best service to get your order delivered in the most timely manner. We are here to help! Our customer service staff will be glad to assist you with any questions or concerns you may have. The item "Odyssey FZGSPBM10WBL New Battle Mode Coffin Case For 2 Turntables & 1 10 Mixer" is in sale since Tuesday, November 28, 2017. This item is in the category "Musical Instruments & Gear\Pro Audio Equipment\Cases, Racks & Bags". The seller is "hifisoundconnection" and is located in Nixa, Missouri. This item can be shipped to United States.